This page shows you how to use PHP Diagnostics. IIS supports PHP via FastCGI. 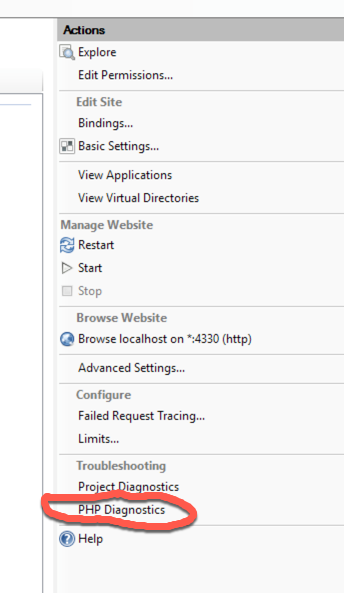 However, registering PHP properly on IIS has been a challenge. Either manually or via Web Platform Installer, you might get a broken installation. Thus, proper tooling is needed to diagnose such broken installation and learn which steps can be taken to make it healthy. Installing PHP via Web Platform Installer today is often problematic. It is highly recommended that you follow the manual steps . 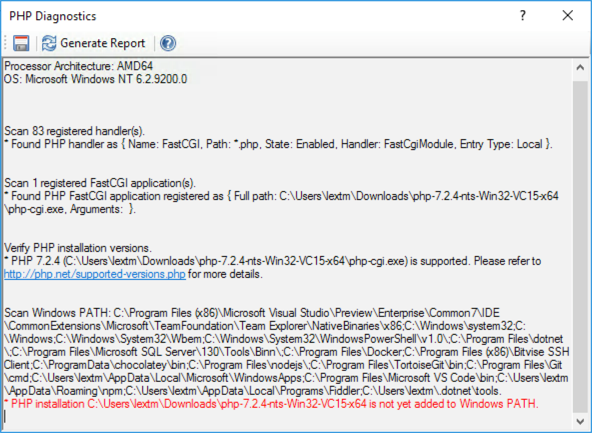 For web sites opened in Jexus Manager, there is an action called PHP Diagnostics showed. The report also provides reference links which might lead you to the right track. PHP Manager for IIS is revived at https://www.phpmanager.xyz .